Bundt cakes are traditionally associated with holiday fare. However, they are good anytime desserts especially when you opt for the mini version. Bundt cakes do not conform to any single recipe; rather, their characterizing feature is their shape. A Bundt cake is baked in a bundt pan that has fluted or grooved sides, but its most defining design element is the central tube or "chimney" which leaves a cylindrical hole through the center of the cake. The shape is similar to that of the earlier European Gugelhupf or Bundkuchen. Anything can be baked in a Bundt-style pan, and is. Recipes range from nuts to dried fruits. Because bundt cakes difficult to frost with all the grooves they are , typically either dusted with powdered sugar, drizzle-glazed, or served undecorated. 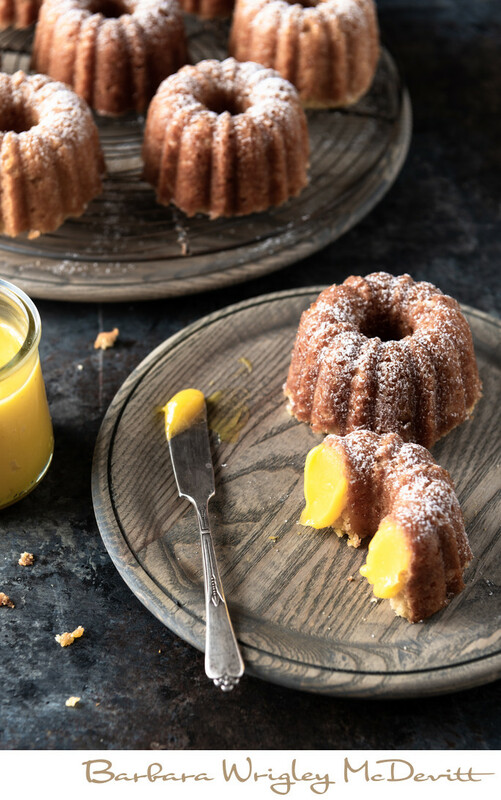 These mini-bundt cakes were filled with lemon curd by piping it in through holes placed strategically around the middle of the cake.